Thread: Anyone using an adjustable post on an Enduro? My buddy has an '07 Enduro and I'm trying to help him find an adjustable post with at least 4'' of drop that will work. Preferably 5''. There is not a whole lot of room for seat post insertion on that frame due to the bent seat tube design. He has a large frame and probably rides with the stock post raised 3'', but I'm guessing. I don't see any reason a gravity dropper wouldn't work. Specialized also makes one, a buddy of mine bought a 2010 enduro that came with an adjustable post, they call it Mission Control or something like that. Mission Control!!! No no no, I'm calling RS! Seriously though, thanks. I think I read on that 50 page adj. post thread over in the AM forum that the GD can but cut. Do you know if that's true? Oh yeah, RS, duh. Getting my "clever" bike part names mixed up, it's the Specialized "Command Post" . Anyway, not sure if you can cut the GD or not, I guess it depends on how/where the spring mounts inside the post. I just got one a few days ago (LOVE it btw). The bike is at the office, I can take a look at it in the morning and post up. If you can cut it, it should be marked with a max cut line. At least one would think so. I'll check in tomorrow, thanks again. I have a 2010 Enduro with the Command Post. Not sure how it would work with the older frame. Having used several GDs previously, I'd say the Command Post is a slightly better product functionally and way better aesthetically. Command post will work fine on the older enduro. . . both seat tubes should be 30.9 . . . which the Command Post is designed to fit around. Looked at the Gravity Dropper. Unfortunately the spring is held in place by an insert that is threaded near the bottom of the post. So it doesn't look like cutting one of these down would be a good idea. 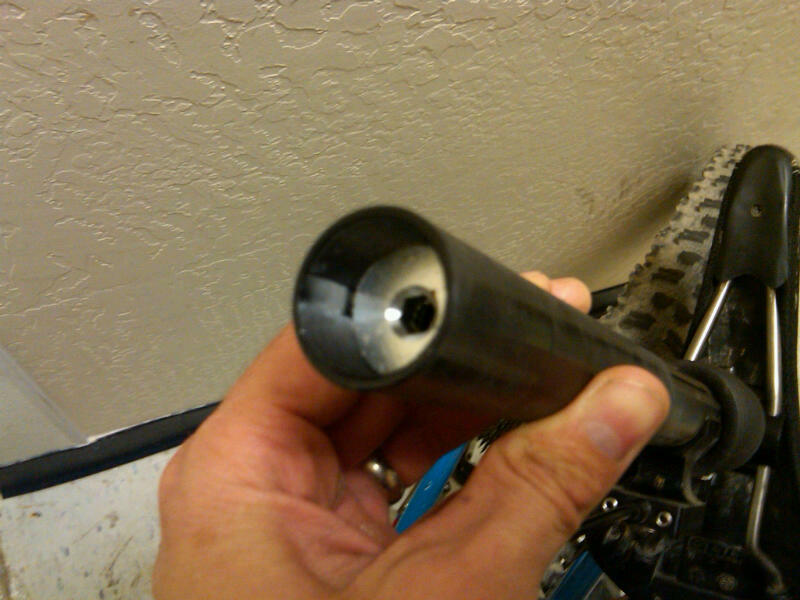 I've got a Command Post on a medium '09 Enduro SL, and it fits fine, however I've read in another thread that older Enduro seat tubes might not be machined as deep, so I'd check max insertion before settling on any particular post. Question: if he rides with the stock post raised 3", what good would a 4" or 5" drop post do for him? I didn't explain it very well. He rides with the post a few inches above the max insertion point (the bent seat tube area). and his stock post is uncut and doesn't go all the way down. He probably has 6.5 to 8'' of exposed seat post.